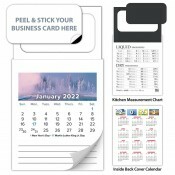 Tear off calendar magnets possess logo-imprinted business card or home shaped business card magnets attached to its top. With the kitchen being the fulcrum of every home, it has never been easier to coax all your clients in one place without these custom magnets. 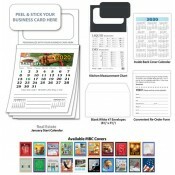 These magnetic tear-off calendars can be easily placed over refrigerator doors and get people hooked. 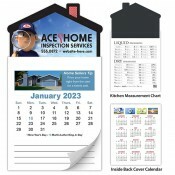 Calendar magnets are one of those value effective tools that will help you get into the homes of your targeted customers and stay there for a year or more. Magnetic tear off calendars make a great promotional choice for businesses and individuals who are trying to capture attention and forge long-term association with their clients/customers. 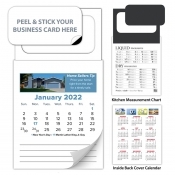 Tear off calendar magnets are identified with typical features such as tearing-off one page for every month and all pages are topped with a business card printed in full color. This business card gives you an opportunity to find footage in the homes of your existing and prospective clients. 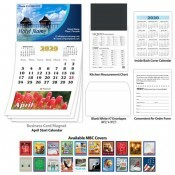 Tear off calendar magnets are usually associated with the real estate marketing. They make a great keepsake for various verticals. They are perfect for-sales team of corporate companies, animal day care centers and doctor’s offices. It can also be used by individual businesses such as plumbers, hair stylists, wedding planners, massage therapists, musicians, gardening and landscaping services, AC mechanics, photography studio, yoga instructors, entertainers such as bands, tambourine players, solo artists and soothsayers, race car drivers, hospitals, old care centers, etc. 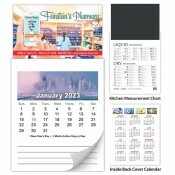 Tear off calendar magnets with house shape imprinted business card is a hot seller in this category. If you do not find these calendar magnets visually appealing, feel free to approach us with your requirement at 855-762-4638 (Toll Free) or mail us at info@Cmagnets.com. You can send your artwork at art@Cmagnets.com or upload it at the upload artwork section of the product checkout page. If you do not have an artwork, we can help you sketch a new one. Free art setup, free design assistance, free online design proof and free shipping are offered on all orders.